‘Transactional analysis is a theory of personality and a systematic psychotherapy for personal growth and personal change’. That’s the definition of TA suggested by the International Transactional Analysis Association. In fact, TA today is all this and much more. 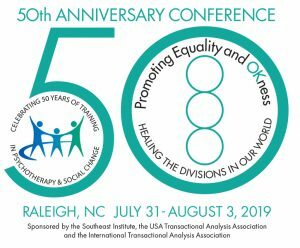 Among psychological approaches, transactional analysis is outstanding in the depth of its theory and the wide variety of its applications. As a theory of personality, TA gives us a picture of how people are structured psychologically. To do so it uses a three-part model known as the ego-state model. The same model helps us understand how people function – how they express their personality in terms of behavior. TA also provides a theory of communication. This can be extended to give a method of analyzing systems and relationships, both in personal life and in work situations. TA offers a theory of child development. The concept of life-script explains how our present life patterns originated in childhood. Within the framework of life-script, TA develops explanations of how we may continue to re-play childhood strategies in grown-up life, even when these produce results that are self-defeating or painful. Thus TA gives us a theory of psychopathology. In the area of practical applications, TA does indeed offer us a system of psychotherapy. It is used in the treatment of all types of psychological disorders, from everyday living problems to severe psychosis. It provides a method of therapy for use with individuals, groups, couples and families. Outside the therapeutic field, TA is used in educational settings. It helps teachers and learners to stay in clear communication and avoid setting up unproductive confrontations. It is particularly suitable for use in counseling. TA is a powerful tool in management and communications training and in organizational analysis. Among the many other applications of TA are its uses by social workers, police and probation authorities, and ministers of religion. TA can be used in any field where there is a need for understanding of individuals, relationships and communication. There are a few key ideas that form the foundation of TA theory. They distinguish TA from any other psychological system. Most basic of all is the ego-state model. An ego-state is a set of related behaviors, thoughts and feelings. It is a way in which we manifest a part of our personality at a given time. The model portrays three distinct types of ego-state. If I am behaving, thinking and feeling in response to what is going on around me here and now, using all the resources available to me as a grown-up person, I am said to be in an Adult ego-state. At times, I may behave, think and feel in ways which are a copy of one of my parents, or of others who were parent-figures for me. When I do so, I am said to be in a Parent ego-state. Sometimes I may return to ways of behaving, thinking and feeling which I used when I was a child. Then I am said to be in a Child ego-state. Note the initial capital letters. They are always used when we want to indicate that we are referring to the ego-states (Parent, Adult, Child). A small letter beginning the word shows we mean a real-life parent, adult or child. The ego-state model is often known alternatively as the P-A-C model, after these three initial letters. When we use the ego-state model to understand various aspects of personality, we are said to be employing structural analysis. If I am communicating with you, I can choose to address you from any one of my ego-states – Adult, Child or Parent. You can reply in turn from any of your ego-states. This exchange of information is known as a transaction, which is the basic unit of social discourse. The use of the ego-state model to analyze sequences of transactions is referred to as transactional analysis proper. The word ‘proper’ is added to show that we are talking about this branch of TA in particular, rather than TA as a whole. When you and I transact, I signal recognition of you and you return that recognition. In TA language, any act of recognition is called a stroke. People need strokes to maintain their physical and psychological well-being. When people are transacting in groups or pairs, they use time in various specific ways which can be listed and analyzed. This is the analysis of time structuring. Each of us, in childhood, writes a life-story for himself or herself. This story has a beginning, a middle and an end. We write the basic plot in our infant years, before we are old enough to talk more than a few words. Later on in childhood, we add more detail to the story. Most of it has been written by the age of seven. We may revise it further during adolescence. As grown-ups, we are usually no longer aware of the life-story we have written for ourselves. Yet we are likely to live it out faithfully. Without being aware of it, we are likely to set up our lives so that we move towards the final scene we decided upon as infants. This unaware life-story is known in TA as the life-script. The concept of life-script ranks with the ego-state model as a central building-block of TA. It is especially important in psychotherapeutic applications. In script analysis, we use the concept of life-script to understand how people may unawarely set up problems for themselves, and how they may set about solving those problems. The young child decides on a life-script because it represents the best strategy that the child can work out to survive and get by in what often seems like a hostile world. In our Child ego-state, we may still be believing that any threat to our infant picture of the world is a threat to the satisfaction of our needs, or even to our survival. Thus we may sometimes distort our perception of reality so that it fits our script. When we do so, we are said to be redefining. One way of ensuring that the world fits our script is to selectively ignore information available to us about a situation. Without conscious intention, we blank out the aspects of the situation that would contradict our script. This is called discounting. As a part of maintaining our script, we may sometimes get into relationships as grown-ups which re-play the relationships we had with our parents when we were children. We do this without being aware of it. In this situation, one of the partners in the relationship plays the part of Parent and Adult, while the other acts Child. Between them, they function as though they had only three instead of six ego-states available. A relationship like this is called a symbiosis. As young children, we may notice that in our family, certain feelings are encouraged while others are prohibited. To get our strokes, we may decide to feel only the permitted feelings. This decision is made without conscious awareness. When we play out our script in grown-up life, we continue to cover our authentic feelings with the feelings that were permitted to us as children. These substitute feelings are known as rackets. If we experience a racket feeling and store it up instead of expressing it at the time, we are said to be saving a stamp. A game is a repetitive sequence of transactions in which both parties end up experiencing racket feelings. It always includes a switch, a moment when the players experience that something unexpected and uncomfortable has happened. People play games without being aware they are doing so. To realize our full potential as grown-ups, we need to update the strategies for dealing with life which we decided upon as infants. When we find that these strategies are no longer working for us, we need to replace them with new ones that do work. In TA language, we need to move out of script and gain autonomy. The tools of TA are designed to help people achieve that autonomy. Its components are awareness, spontaneity, and the capacity for intimacy. It implies the ability to solve problems using the person’s full resources as a grown-up. TA rests upon certain philosophical assumptions. These are statements about people, life and the possibility of change. It is a contractual method. The most fundamental assumption of TA is that people are OK. This means: you and I both have worth, value and dignity as people. I accept myself as me and I accept you as you. This is a statement of essence rather than behavior. At times, I may not like nor accept what you do. But always, I accept what you are. Your essence as a human being is OK with me, even though your behaviour may not be. I am not one-up to you, and you are not one-up to me. We are on the same level as people. This is true even though our accomplishments may differ. It is true even though we may be of different race, age or religion. Everyone except the severely brain-damaged has the capacity to think. Therefore it is the responsibility of each of us to decide what he or she wants from life. Each individual will ultimately live with the consequences of what he or she decides. You and I are both OK. We may sometimes engage in not-OK behavior. When we do, we are following strategies we decided upon as young children. These strategies were the best ways we could work out as infants to survive and get what we wanted from a world that may have seemed hostile. As grown-ups, we still pursue these same patterns at times. We may do this even though the results are unproductive or even painful for us. Even when we were young children, our parents could not make us develop in one particular way rather than another. They could certainly exert strong pressures on us. But we made our own decisions whether to comply with these pressures, to rebel against them or to ignore them. For us as grown-ups, the same is true. We cannot be made to feel or behave in particular ways by others, or by ‘the environment’. Other people, or our life circumstances, may exert strong pressures on us. But it is always our own decision whether to conform to these pressures. We are responsible for our own feelings and behavior. Any time we make a decision, we can change that decision later. This is true of the early decisions we made about ourselves and the world. If some of these infant decisions are producing uncomfortable results for us as grown-ups, we can trace the decisions and change them for new and more appropriate decisions now. Thus, people can change. We achieve change not merely by insight into our old patterns of behavior, but by actively deciding to change those patterns. The changes we make can be real and lasting. If you are a TA practitioner and I am your client, then we take joint responsibility for achieving whatever change(s) I want to make. This follows from the assumption that you and I relate on equal terms. It is not up to you to do things to me. Nor do I come to you expecting you will do everything for me. Since we both take part in the process of change, it is important that we both know clearly how the task will be shared. Therefore we enter into a contract. A contract is a statement of the responsibility of each party. As client, I say what I want to change and what I am willing to do in order to bring about that change. You, as practitioner, confirm that you are willing to work with me in this task. You undertake to use the best of your professional skills in doing so, and say what recompense you want from me in return for your work. Eric Berne insisted that the client, as well as the practitioner, should have full information about what is going on in their work together. This follows from the basic assumptions that people are OK and that everyone can think. In TA practice, case notes are open to the client’s inspection. The practitioner encourages the client to learn the ideas of TA. Thus the client can take an equal role in the process of change. To help in communication, the ideas of TA are expressed in simple language. Instead of the long Latin- or Greek-derived words customary in some other branches of psychology, TA speaks in familiar words: Parent, Adult, Child, game, script, stroke. Some people have assumed that this straightforward language must reflect superficial thinking. Their view is mistaken. Though TA’s language is simple, its theory is profound and closely reasoned. 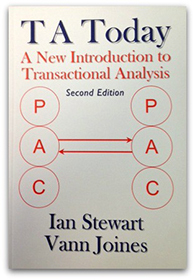 Many thanks to the authors of TA Today: A New Introduction to Transactional Analysis, Second Edition for permission to use this material from their book.